In the last 21 sessions, BSE Sensex on two occasions has plunged by 1,000 points. On September 21, it slumped by 1,100 points due to falling NBFC stocks and on October 10 it dipped by over 1,000 points attributed to hike in the Federal rates in the US. As a result, on October 11 alone, foreign institutional (FII) and portfolio (FPI) investors sold stake worth Rs 2,869.41 crore. 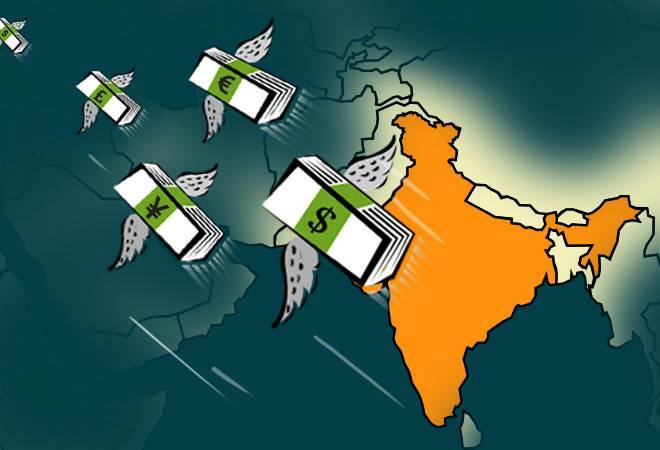 India has witnessed foreign fund outflows of about Rs 83,000 crore this year, ballooning their total equity sell-off in October to over Rs 17,000 crore. The latest sell-off comes after a net outflow of over Rs 21,000 crore from the capital markets (both equity and debt) last month. Prior to that, they had put in a net amount of Rs 7,400 crore in July-August. Foreign fund managers now have to provide higher returns to their clients than promised at the beginning of the year, as FII/FPI now have to account for the 16 per cent depreciation in the Indian rupee and improved investor sentiment in the United States. For example, if the FPI/FII is estimated to provide 8 per cent returns to their clients through investing into emerging markets such as India, now they have to earn a return of 24 per cent (8+16) per cent accounting for the fall in rupee, keeping all other variables constant. Foreign Portfolio Investors (FPI) have been net sellers throughout this calendar year barring a few months. However, the swiftness of their exit in October has led to corrections in the markets. Let's look at 7 factors which are influencing FII and FPI's losing interest in Indian markets. Higher US yields: The Fed hiked its policy target by a quarter of a percentage point to 2.00-2.25 percent and indicated that it foresees another rate rise in December. Three more hikes are expected next year, and another in 2020. This increase in US yields are making emerging markets less attractive for foreign investors. Higher US yields have encouraged foreign investors to withdraw funds from emerging markets and re-invest in the US. Tumbling Small & Mid-Caps: The S&P BSE Small-cap index had hit a high of 20,046 on January 15. On October 11, it fell to 13,800, plunging 31 per cent since January. The S&P BSE Mid-cap index recorded a high of 18,321.37 on January 9 and since then, the mid-cap index has fallen 23.86 per cent. This plunge in the markets has erased most of the wealth created since March 2017. For foreign investors, mid-caps and small-caps have lost their sheen due to their consistently declining returns. Rupee Depreciation: Since January, Indian Rupee has depreciated by over 16 per cent to record a new all-time low practically every month. The decreasing value of rupee implies an increased cost for Indian economy to pay for its import obligations, thereby risking an increase in inflation. FIIs are concerned as they have to earn more returns to substitute the fall in their portfolio value due to rupee depreciation. SEBI: SEBI announced a set of new rules for foreign fund ownership last month. Its objective was to stop Indians from round-tripping their money. If implemented, the fund managers of Indian origin, whether residents, NRIs, OCIs, or others, would need to limit their holding in the funds they manage or in the AMCs managing them. A lower exposure, directed by SEBI, discourages inflow of FII money. Fear of US sanctions and trade war: The trade war between US and China has escalated on the back of import tariffs imposed by the US President Donald Trump on the Chinese imports. US has imposed tariff on Chinese imports worth $250 billion in three rounds so far this year. Reacting to the trade war, Asian Development Bank's President Takehiko Nakao has warned "people will start worrying about the credibility" of the multilateral free trade system that the world has believed in for so long and adversely affect the global investor sentiment. This could shave 1 and 0.2 per cent growth rate of China and US respectively, Nakao added. Foreign investors are worried the trade war may spill and negatively affect Indian export potential, and ultimately reduce investor returns. Reduced ratings and default of NBFC: The recent strings of default by IL&FS led the rating agencies to downgrade its commercial papers to 'junk'. This cautioned investors and led to a sell-off in NBFCs such as Dewan Housing Finance Ltd. DHFL shares tumbled by 60 per cent backed on relentless selling by DSP Mutual Fund. This lack of confidence in the NBFC space has reduced the prospects of fresh capital inflow by foreign investors. Rising crude oil prices: This year alone brent crude oil has appreciated by 17.25 per cent. The rise in crude oil implies that logistics cost for all commodities such as food items, agricultural output, expenses on daily transportation would rise thereby increasing inflation. This would impact the profitability of most companies, which would lead to fall in stock prices of such companies, erasing investor wealth.